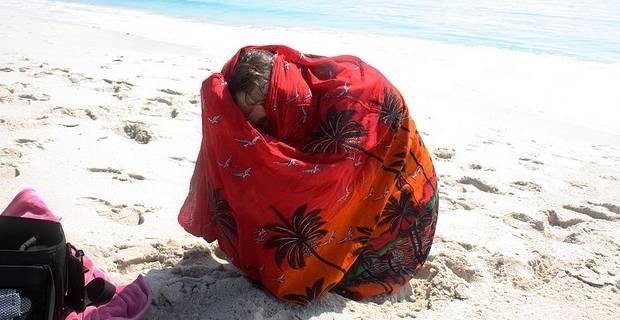 Sarongs are very versatile pieces of clothing, especially in the summer and on the beach. They can be worn as a halter dress, a wrap skirt, a two knot dress, strap dress, fold dress, side knot dress, a Rio dress and many other ways too. Here we will take a look at a few of the many different ways to wear a sarong. The easy way to wear your sarong as a long dress is to hold it lengthways behind you, bring the corner in your right hand in front of you and hold at your left shoulder. Bring the other corner all the way around you and tie together. You now have yourself a long sarong dress. To make a strapless dress, hold the sarong lengthways behind you at bra line. Bring the two ends in front of you and swap the corners between your hands twice in the same direction. Pull the ends towards your body and tie them behind your neck. To make a double wrap skirt simply fold the sarong in half and hold it lengthways in front of you. Hold one end of it to your side and wrap it round your waist twice, then tie the ends together at the side. To learn how to do more complex things with a sarong, check out some of the many videos and step by step instructions online. Or why not make up new ways yourself? Just remember to practice at home first to avoid having a wardrobe malfunction at the beach.